Filipinos were among the first immigrant groups to work in Italy, starting in the early 1970s. They constitute the sixth largest foreign community after the Romanians, Albanians, Moroccans, Chinese and Ukrainians. Most Filipinos are concentrated in major cities like Milan(42,236), Rome41,311), Some 20.4 percent are found in other municipalities. They work mainly as domestic helpers or family caregivers. Some have found work in shops, factories and in various services. With the employment opportunities available, Filipino women outnumber Filipino males–72,599 males vs. 95,260 females – with valid work permits. The rest are their dependents – 14, 551 to 15,565. Italy is the fourth largest source of remittances to the Philippines. In per capita remittances, Filipinos rank second only to Chinese immigrants. The Italian economy is industrialized and diversified. It is dominated by the manufacture of high-quality consumer goods produced by small and medium-size enterprises, many of them family owned. Italy also has a sizable underground, untaxed economy, which by some estimates accounts for as much as 17 percent of the gross national product. However, Italy is divided into a developed industrial north, dominated by private companies, and a less developed, welfare-dependent, agricultural south, with high unemployment. Italy is the third-largest economy in the euro-zone, but it is saddled with high public debt and has imposed austerity measures. Its decreasing native labor force, due to aging population and low fertility rate add to its burdens. Thus,immigrants became an important force in the economy. Four million Immigrants now contribute about 11 percent of the Italian gross domestic product and pay taxes amounting to about €33 billion. The 3.5 percent of the companies that migrants own and operate pay some €7.5 billion of the country’s social security (Caritas Migrantes – Dossier Sull’ Immigrazione). The government, aware of Italy’s need for migrant labor to work on farms and in factories and fill other work that many native Italians are reluctant to do, has instituted several amnesty programs to regularize the stay of undocumented workers. It also has a family reunification program that allows immigrant parents to send for their children up to the age of 18 years. In 2008 up to 16 percent of Filipinos came to the country to join their families compared with almost 79 percent who came for employment (Colombo and Martini, 2010). The rise in the Filipino birth rate in Italy is contributing to the growing Filipino population. Some 1,598 Filipino babies were born in 2008 alone. Although not immune to discrimination and abuse, Filipinos do not suffer as much as trafficked immigrants. Employers value them for their familiarity with English and their work ethic. They are also credited with revitalizing parishes that have suffered from the loss of native congregants. But culture, language and race hinders their full assimilation into Italian society. Filipino children and youth brought to Italy tend to suffer the most. Emotional and identity issues confront them, and they can be vulnerable to risky behavior. Italian-born Filipinos have fewer problems integrating. They become in many ways, as Italian as any native Italian children, taking on many of their values, culture and habits. This cause considerable conflicts in some cases, with Filipino parents who consider Italian children and youth as too disrespectful to parents. 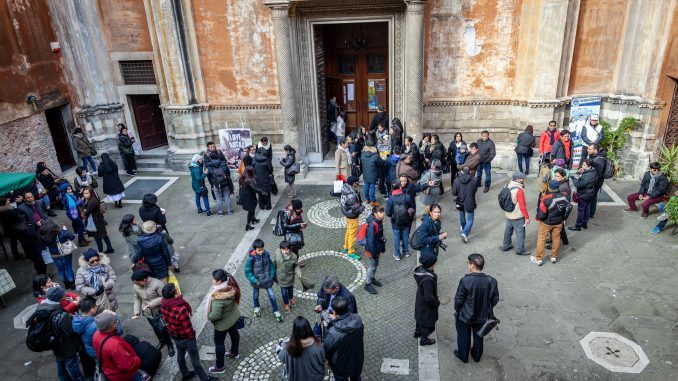 At present, there are more than 70 Filipino community organizations all over Italy. Most are church based and often have close links with priests and chaplaincies that minister to their religious and counseling needs. The migration policies of the present extreme right populist government of Italy is posing problems to undocumented Filipinos and other foreign nationals in the country.